Discovering old, unique gravestones always excites me. Even the bizarre ones with skeletons reclining against hourglasses, like the one below. 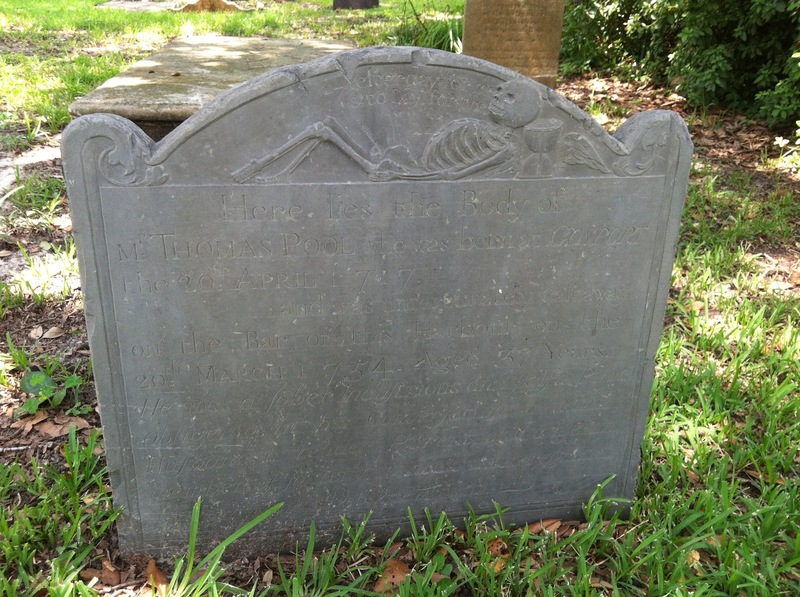 I featured this photo of a Charleston grave marker in a past blog post. I admit, I am not a very enthusiastic fan of most modern markers, be they flat bronze plates that enable cemetery grounds crews to mow the grass more easily, or row after row of the same mid-century marble gravestones. Don’t get me wrong. 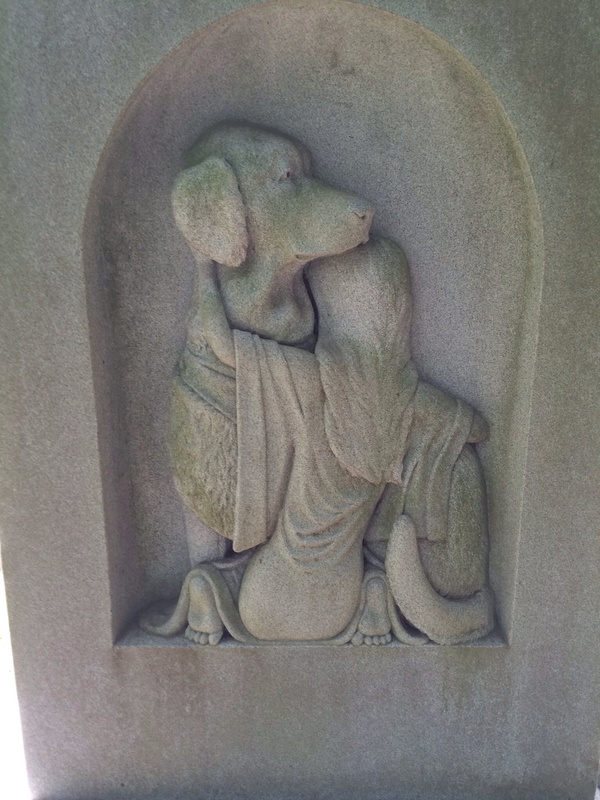 I know that most people cannot afford the elaborate statuary that I come across in older cemeteries. Some of it is so grand and ornate, it boggles the mind that someone had the money to pay for it. The type of craftsmen who spent months sculpting such works of art no longer exist. The creativity that so detailed those old stones seems to have faded into the sunset. 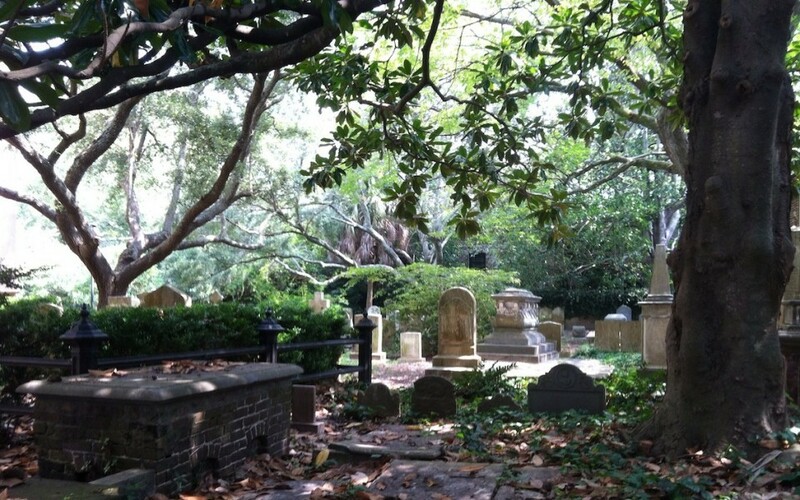 My viewpoint was challenged when I recently returned to Charleston and visited Magnolia Cemetery again. 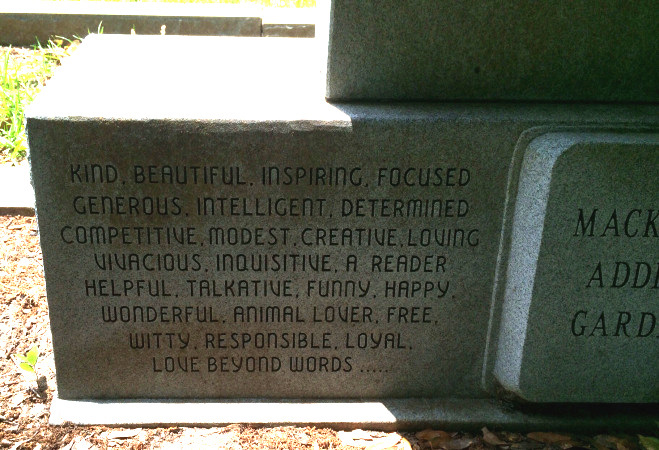 I came across a modern gravestone that even a traditionalist like me could stop and appreciate. From the moment I saw it, I realized that the person it was made for was very special. My apologies for the darkness of the photos but the marker is under some heavy tree shade. The memorial stone for Mackenzie Addison Gardner tugs at the heartstrings. A little girl and her beloved canine companion. 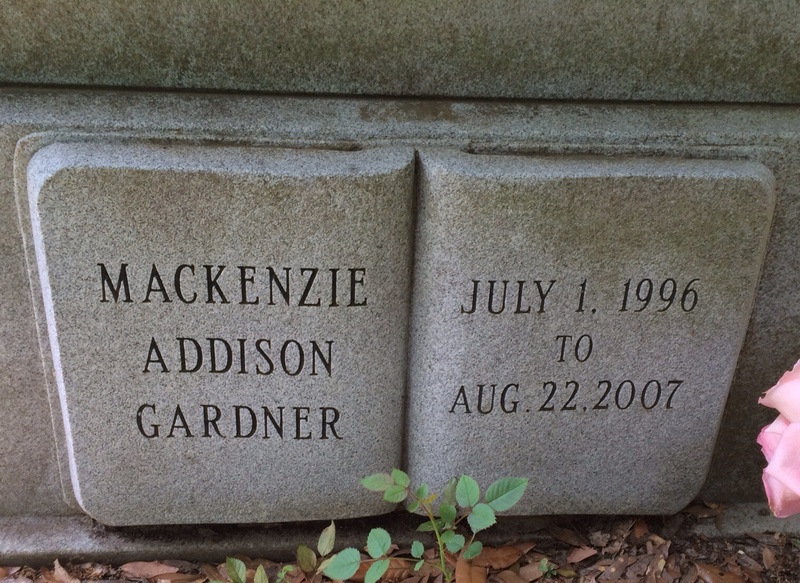 Mackenzie Addison Gardner was only 11 when she died in 2007. A short life, to be sure. But the words engraved in the stone describe a child who lit up the world around her. …[she] was a member of the Jazz Dance Group of the Mount Pleasant School of Performing Arts and the Pinckney Players and enjoyed horseback riding, playing violin, going to the beach and lake, and making her parents proud. Mackenzie will be remembered by her close friends and family for being the bravest girl they will ever know. The obituary also requested that in lieu of flowers, donations be made to the Cystic Fibrosis Foundation. I can only surmise that Mackenzie had CF and that her cause of death may have been tied to it. UPDATE: I recently learned that this statue was done by a sculptor named A.C. “Clint” Button II of Carolina Sculpture Studio. 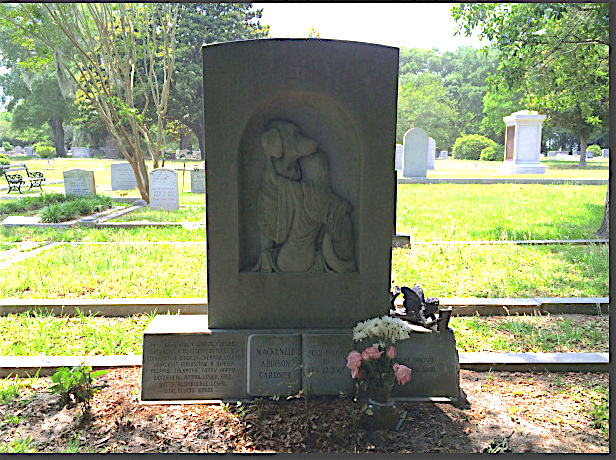 The family came to him with the idea of having the marker made of Mackenzie and her beloved dog, Wolfie. You can watch this video to see how it all unfolded. I was actually driving away from this part of the cemetery when I saw it and had to stop, get out and look at it. The shaded vista it’s located in is quiet and perfect for meditating. Just what she would have wanted, I think. Mackenzie’s memorial changed my mind about modern gravestones. I’m happy to say I now look at them with a less jaded eye and am more open to the possibilities. I will always love the old, unique stones. But there’s room for the appreciation of new ones, too.